Time to let the myth of the rugged individualist die. Americans take pride in being rugged individualists, leveraging personal gain in order to survive. In nature it’s the “survival of the fittest” and business must “crush the competition.” Those are old ideas and they’re dying a horrific, violent, slow death. While it may seem as though events occurring at a distance have no direct impact on us (Fukushima), we’ve also seen that the entire globe is connected and those events happening to “other people” do in fact affect us (Fukushima). This connection is more profound and mysterious than the overused “Butterfly Effect,” where a bug’s wings in South America supposedly triggers a hurricane on the East Coast. However, we live in a closed environment and everything we do effects everybody else. Entire books have been written about the cooperative versus competitive nature of the universe and I’m oversimplifying the concept to introduce one example of it: Selling books. Several authors made the headlines a few months back for using sock puppets (fake accounts) to write terrible reviews of other author’s books. They believed that discouraging sales of titles (using poor reviews) in the same genre would result in more sales of their title. Readers spend about 2.3 seconds deciding whether or not to purchase a book and most of that has to do with (1) cover and (2) title. To be clear, reviews matter. Not in relation to other titles, but mostly in relation to the reader’s own internal belief system about what constitutes quality. A wise Greek once said, “In union there is strength.” I don’t think Aesop meant strength in a multi-author box set, but he would have if he had access to Amazon when he was trying to peddle those stupid fables. I’ve declared 2014 my Year of Collaboration. I’m reaching out, up, and down to find authors that also believe a sale of one novel is a sale for all novelists. I’m not interested in competing against my fellow authors because working with them is much more effective. Whether it’s with collections (warning: soft sales pitch below) or co-writing, I’m open to what others can bring and what I can share with them. 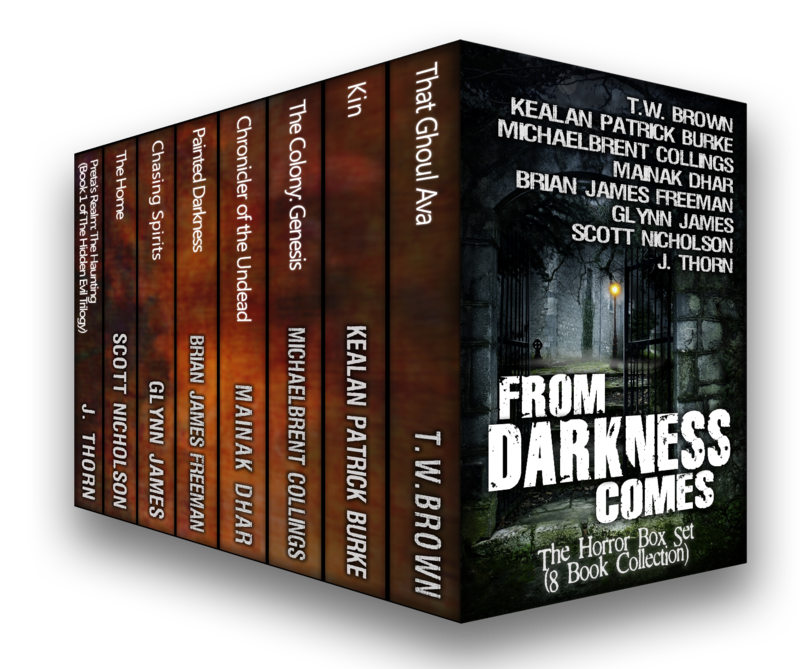 My most recent collection contains Preta’s Realm: The Haunting (Book 1 of The Hidden Evil Trilogy) along with seven other phenomenal books. We’re selling the ENTIRE collection for only $0.99. 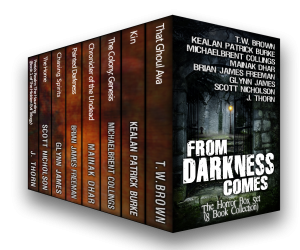 Some of the best horror writers in the world are part of this anthology including Scott Nicholson, Kealan Patrick Burke, Glynn James, Mainak Dhar, Michaelbrent Collings, TW Brown and Brian James Freeman. The collection will be available only for a limited time. Offer your services, knowledge or muscle and the universe will return it to you. Our collective spirit will always outshine the individual one. I love weird, twisted, horror stories. Do you? As I continue on this crazy journey called life I imagine I’m driving a huge party bus with all of you on it. Every so often we stop and pick up a few more people, a bag of ice and a lighter. Don’t ask me where we’re going because I don’t know. It doesn’t really matter anyways because anyone that’s taken a road trip with a bunch of friends knows that getting there is more than half the fun. It’s at least 76.7% of the fun depending on who gets arrested along the way. Using that poor metaphor, I feel as though I need to pause every now and then and introduce myself to those getting on the bus. People reading my blog and my books (i.e., those getting on the bus, but you already figured that out) don’t know me that well yet but they’re intrigued by the party. Those of you in the back–quitting throwing stuff out the windows. Nobody is allowed to use the john unless it’s an extreme emergency. And flush, would ya? I love horror–the kind where the fear comes from inside your own head. I’ve enjoyed my share of gory slasher stories but I don’t write too many of those. Yes, my creatures do some heinous things but not for the sake of the violence. I’m enamored with the evil that’s inside all of us and why some people can keep it contained while others can’t. My books are an escape from reality. They’re odd, esoteric and thoughtful with an economy of language. I front a heavy band in Cleveland, Ohio (Threefold Law) and so my style is very lyrical as well. Being a writer and a musician, I feel as though I have a perspective on storytelling that others might not. My new partnership with Rebecca T. Dickson (interviewed her last week, fyi) means that the updated versions of my books along with the new ones I’m writing will withhold NOTHING from you. I’ve been criticized for not explaining enough and I can promise you that won’t be the case anymore. If you want to get a sense of the kind of stories I tell, grab this collection. 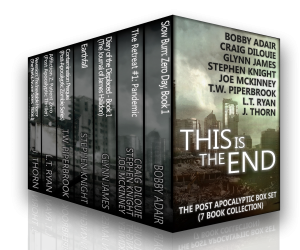 My book, Reversion: The Inevitable Horror (The Portal Arcane Series – Book I) is included along with 6 other phenomenal books and the ENTIRE collection is only $0.99. 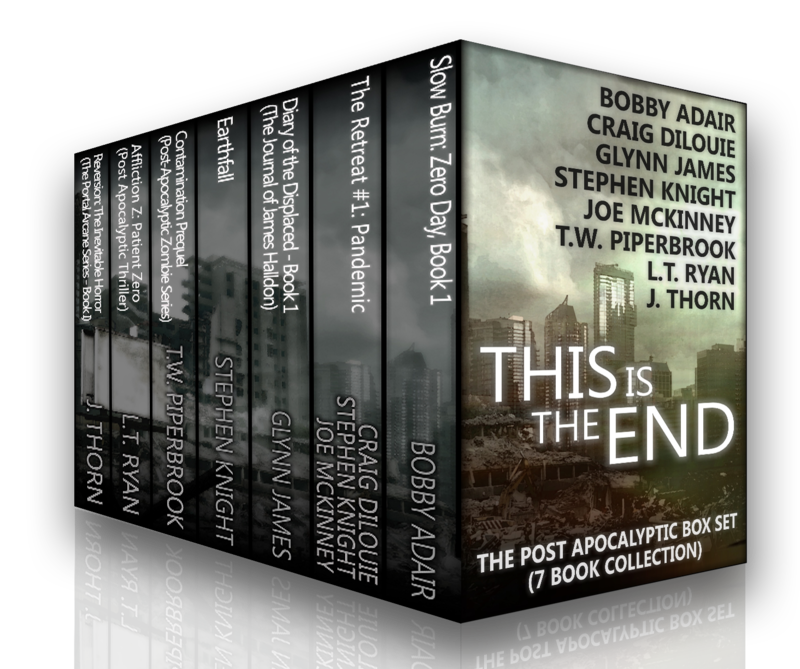 Some of the best writers in the genre are part of this anthology including Bobby Adair, Craig DiLouie, Glynn James, Stephen Knight, Joe McKinney, T.W. Piperbrook and L.T. Ryan. This is a helluva bargain. The collection will be available only for a limited time. Now get on the bus and stop holding up the line.